The great Manny Ramirez is reportedly in the process of filing paperwork with the offices of Major League Baseball to be reinstated. He is seeking to be taken off of the list of retired players so he could be free to sign with a new club. Ramirez retired in April immediately after being informed that he had failed a second drug test and would have to serve a lengthy suspension of one hundred games. 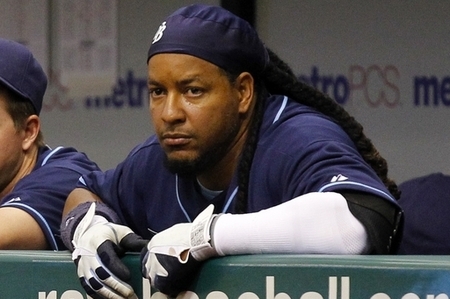 At the time, Ramirez was a member of the Tampa Bay Rays. If reinstated, Ramirez would have to first serve his suspension before being able to play his first game. Ramirez would be 40 years old by the time he is eligible to play his first game. In 19 years as a Major League Baseball player, Ramirez has been an All Star 12 times, has 555 home runs, a .312 batting average, and 1,831 RBI. Ramirez has played for the Cleveland Indians, Boston Red Sox, Los Angeles Dodgers, Chicago White Sox, and the Tampa Bay Rays. He won two World Series championships with the Red Sox. With his age and the fact that he would definitely miss more than half of the season, it is not definite that Ramirez will receive many contract offers.